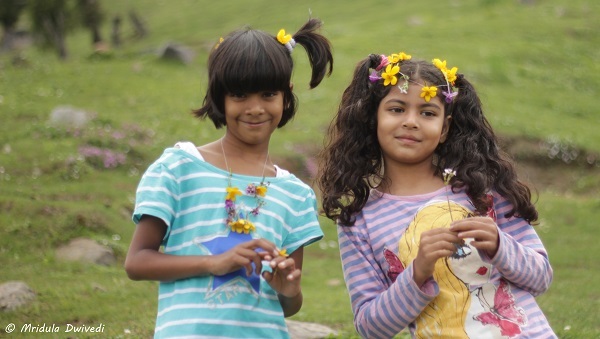 How is it possible that two women and two children go on a trek in Himachal Pradesh and come back to tell the happy tale? It is because of our incredible guide, Rama Kant Sharma and his team. 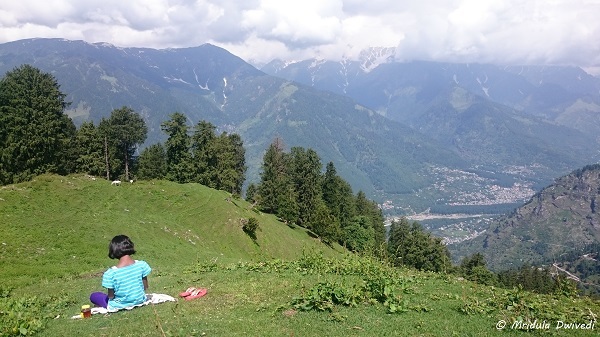 I consider Himachal Pradesh safe for solo woman travel but I will think a hundred times before venturing out in isolation without a reliable guide. So this is a thank you note to Rama Kant ji and his trekking team of Arun, Hem Raj ji and Gopal. The beautiful woman on the right hand side is Monika, Ramakant ji’s wife but she was not trekking with us. You never know what is going to happen when two small children are going on a trek. It is only because of Rama Kant ji and Arun that we dared to trek with the brats! The kids thankfully walked all the way while going up as well as coming down. 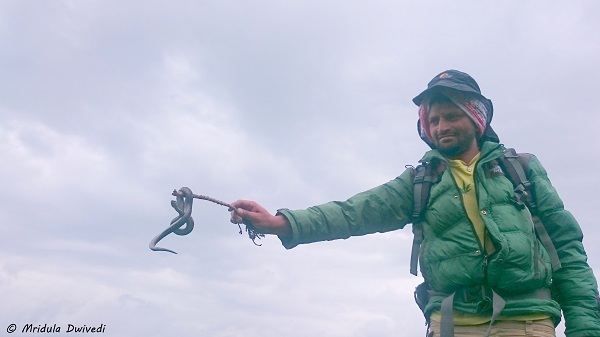 But last year when Chhavi and Tanya (Rama Kant ji’s daughter) went on a trek with Seshadri to the same region, I got to know that Arun carried Chhavi on his back for quite some distance. Rama Kant ji was himself away on some other trek then. 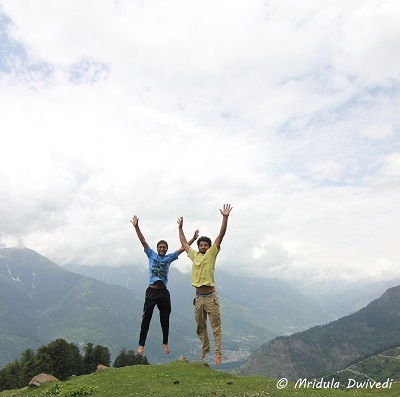 So, this was second trek for Chhavi with Arun, whereas I was trekking with him for the first time. We have known Rama Kant ji and his family since 2010. We have stayed at his home on so many trips. Chhavi is quite comfortable with both Arun and Rama Kant ji. It is one thing to walk with the kids on the trail and quite another to entertain them even otherwise. Chhavi was so prone to sitting in Arun’s lap that she would not even let him eat food at times! As the kids would often play with Arun, I would have time to myself! While walking Arun would carry a backpack full of juice and chocolates. He told the kids that it was a magic bag! The kids would have eyes as big as saucers while listening to his tales. 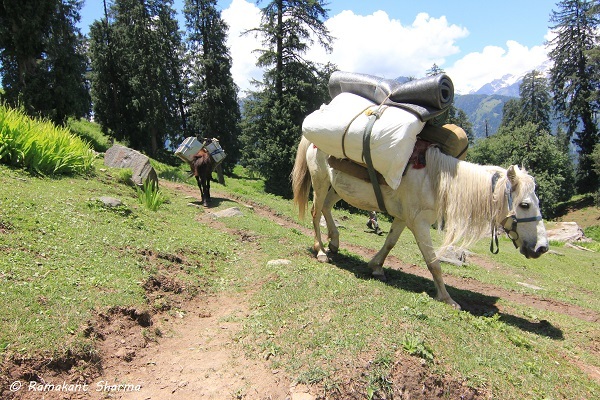 Chhavi still believes that Arun carried a magic bag with him on the trek! The girls were behaving like the characters of the movie- Frozen, one of them would be Anna and the other Elsa. By the end of the trek I was really tired of this silly game. They also proclaimed them to be queens- frozen queen, ice queen, color queen, flower queen and what not. And then they would fight over who would get to act what. I have to say it was the most tiring game I ever witnessed over a trek! In moments of sanity Chhavi would do her usual things, like acquiring a horse! On the third day we simply stayed at Jamadi. Rama Kant ji, Arun and I went a little ahead leaving behind Anita, Kashwi and Chhavi. While we walked up, rains came. The kids were playing at a short distance from our tents. So, we assumed that they would get inside when it rained. We continued walking up and got a bit of hail as well. To our surprise, when we got down much later, they were sitting at the exact spot where we left them, covered in the poncho Rama Kant ji gave them and the umbrella that I lended. Arun descended the rest of the way in a less than a minute and produced juice for the kids from his magic bag. And before I could realize what was happening, they whisked off the kids on their backs to the tents within no time. It is another matter that they started fighting and had to be given chocolates as well so that they would keep calm till Anita and I arrived. Later in the kitchen tent Chhavi was feeling a little cold. Rama Kant ji put her in his jacket and she quickly forgot all about cold. And it is not beyond Rama Kant ji to put away a stray snake that may meander in our paths! This happened while we were walking higher and the kids were waiting with Anita. He told me the snake was not poisonous! He just put it away, all intact! It is a pity that I forgot to click a picture of Gopal, who handled the horses with our luggage. Gopal would often get the unenviable task of fetching the water from the water source! At Jamadi it was at some distance. Camps have to be set near water sources or there would be no water for anyone to drink! Food would also not get cooked. Hem Raj ji was our cook for the trip! We have traveled before to Chandratal in Spiti. He is such a jovial person, and he loves to feed people! 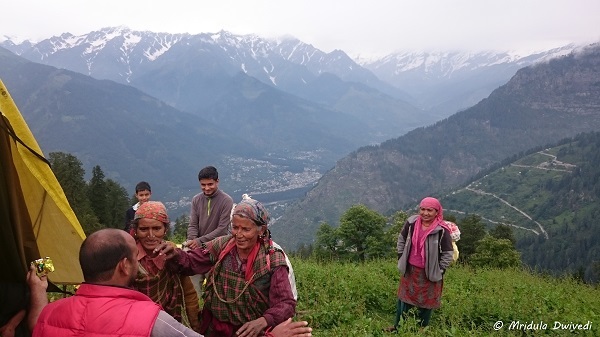 The Himachali ladies were going back to their village in rain after collecting herbs from the wild. They stopped for a cup of tea in our kitchen tent. The daughter of the lady on the extreme right studies in Delhi. The oldest lady didn’t know her exact age! She smoked a bidi in an expert manner. So, this is just to say a huge thank you to Rama Kant ji, Arun, Hem Raj ji and Gopal for taking us on the trek and getting us all down in one piece! May we trek together again! 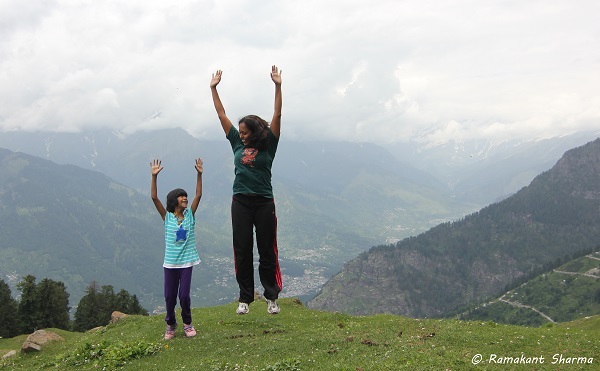 So many emotions that run through my heart when I think of my recent trek with Chhavi. 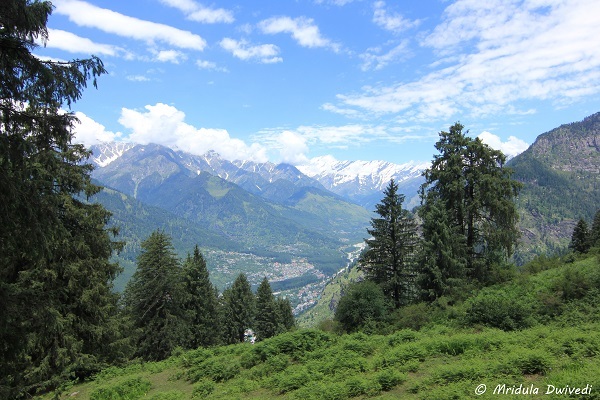 We trekked up to Jamadi in Himachal Pradesh. It is not the first trek that I did with her. In fact, we took her on treks when she would go up on a pony. This was the first trek where she walked all the way on her own along with me. 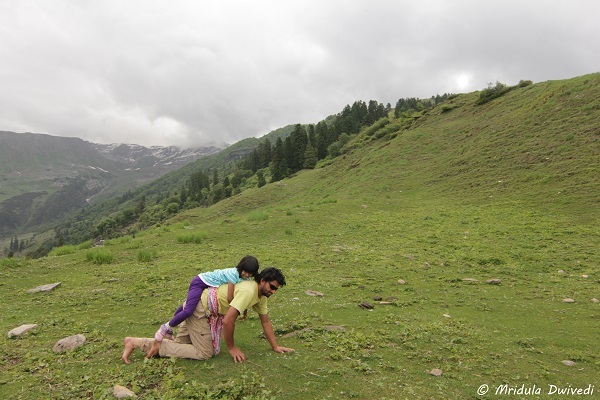 Trekking with my daughter is so special. As I said before, I would lying if I would say it was easy. But it is quite incredible the way she has grown up and the distances she can walk now! We both enjoy being outdoors. In a way we are similar. Both of us do not like to get our pictures clicked. 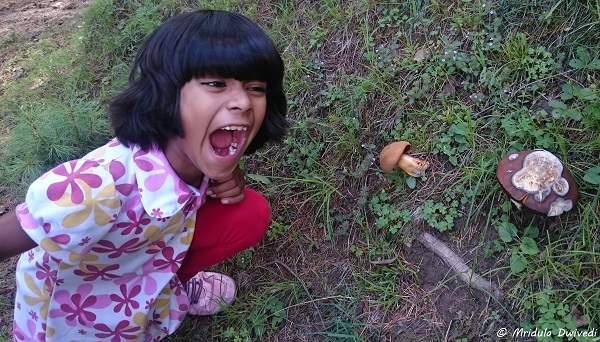 I have realized that it is easy to click if she is doing something, for example pretending to eat a mushroom! But let me start at the beginning. 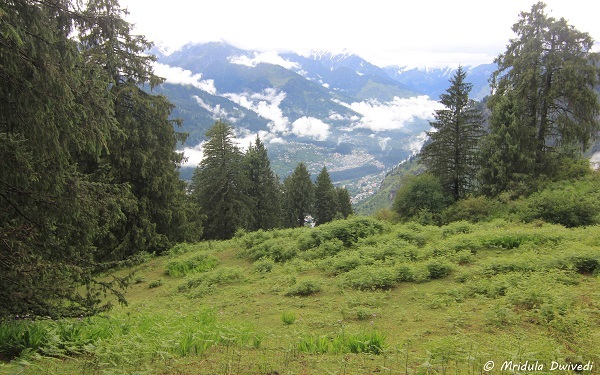 Long time back, in 2011 we walked up to the temple above Jagatsukh. 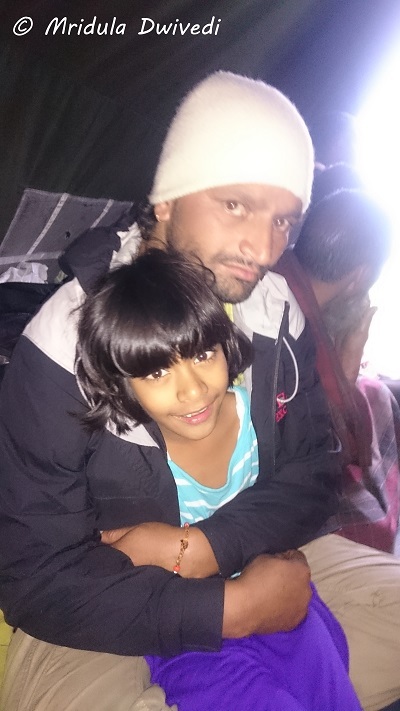 Chhavi was so small that she was mostly carried by people on their shoulders. I clearly remember that she fell asleep in Om Prakash ji’s lap while coming down. It was difficult to wake her up later in the evening. 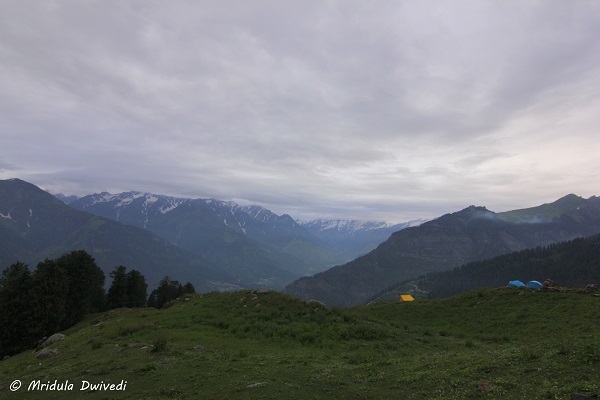 This time, our first campsite was beyond the temple at a place called Baggi. And she gave us absolutely no trouble in walking up to Baggi. The days were really long, so we had ample sunlight after reaching the campsite at Baggi. She played with a mountain dog most of the time along with her friend Kashwi. She obliged me with the photograph as well! She ate well and posed no problems in falling asleep. The second day’s walk was longer and more uphill. Mid way both the kids started cribbing that they were tired. We took ample breaks. Just before this hillock, we gave them chocolates and juice. Something happened to Chhavi after that. My husband and I were never any match for Chhavi when she got down. Even two years back she just ran downhill while I would tell her to slow down or else I would fall. This time after chocolate and juice she started running uphill, leaving me far behind. 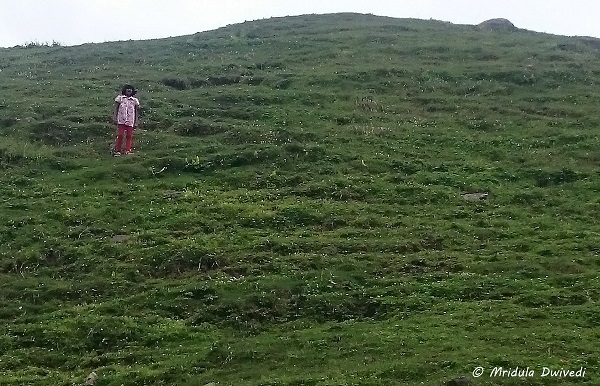 There she was, standing quite close to the top and telling me, “Mommy don’t stop, trekkers should keep walking!” And there I was huffing and puffing and marveling at how fast they grow up! Right behind the edge was our campsite! All the three tents belonged to us. Actually there is a more popular campsite a little ahead but as the kids were tired, we camped before the main place. I loved it, having the whole place to ourself! At Jamadi it was cold, the jackets were out. After walking so much, the kid was hungry and would eat on her own! It is such a blessing. She has never been fussy about falling asleep! The next day by the time I emerged, she had found a quiet spot for herself and told me that she wanted to be left alone! This was a first. My guess is that the kids fought with each-other and hence this demand for isolation. She was having her breakfast sitting there all by herself. She would ask me to pass on the beard and stuff but nothing more! However, as soon as she had some bread inside her stomach, she told me she was sorry that she asked me to go away! I said it was alright as I do the same at times! 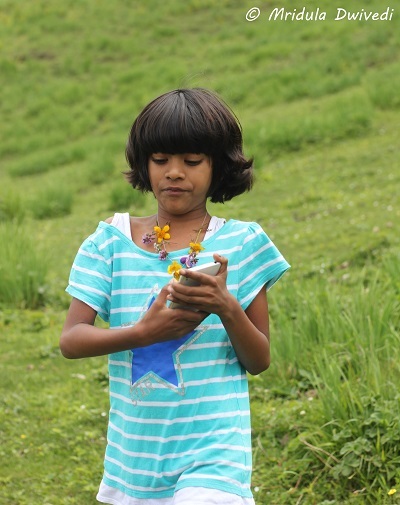 When I asked her what she liked most about the trek, she told me loudly- the flowers! The meadows were full of wild flowers which the kids loved to collect. Rama Kant ji made this necklace for her! When I asked her what she liked the least, she told me- the rains! It was a strange trek in the sense that our phones worked. Because of the kids, we trekked only a small distance. She would talk to Seshadri everyday. When she would be very tired she would tell me, “isse acha hota mein aate hi nahin, papa ke paas rahte.” (It would have been better if I stayed home with papa). She once started crying that she was missing papa as well. 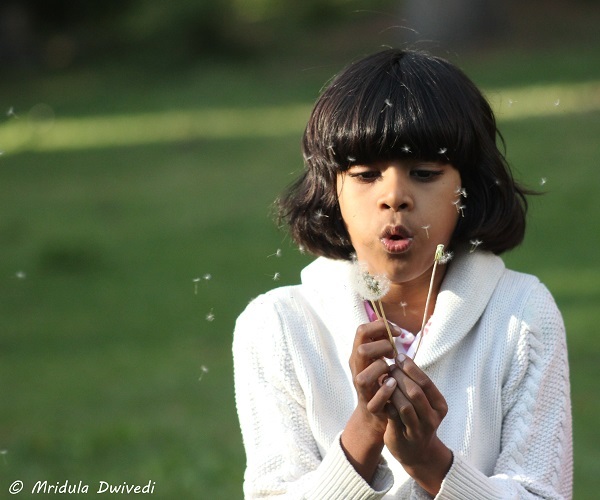 And when she would be in a happy mood, she would start doing cartwheels without any warning! Overall if you ask her if she would trek again her answer is a firm yes! And here it is, when she would simply rise her hands and laugh at me, who jumped for the sake of the picture! True to her form, she just ran through the way while getting down to Jagatsukh, whereas I made up the rear with my creaking knees! But trekking with my daughter is so much fun. I hope she will like trekking even after she grows up! 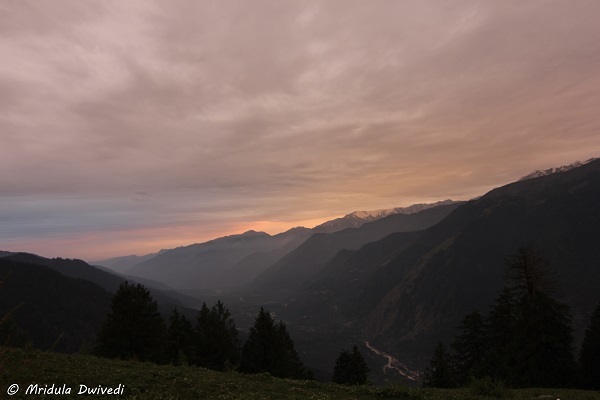 We came back from our short trek in Himachal Pradesh yesterday. 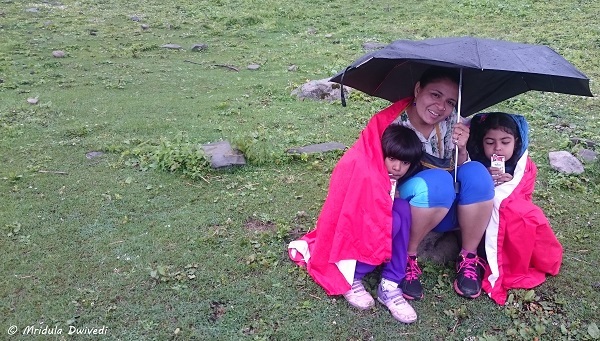 My neighbor Anita and her daughter Kashwi joined Chhavi and I on this adventure. 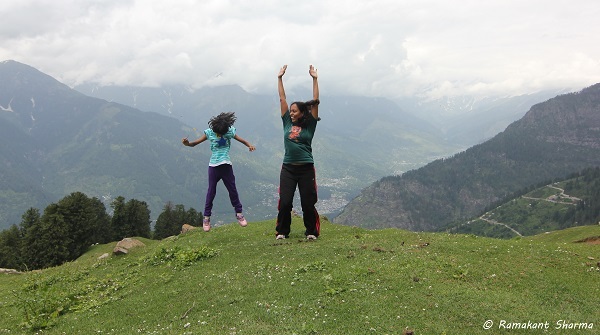 As both the kids are less than ten we picked up an easy Himachal Pradesh trek. Ramakant ji have been our guide in Himachal Pradesh since many years. The added blessing is that we stay at his home in Jagatsukh! My legs ache from the walk downhill as I am writing this, sitting cozily at his home! It was crazy to trek with two kids. When they would play together, it was a lot of fun but when they would start fighting … just don’t ask! The good bit is that both the kids are willing to trek again! But I will start the trek stories when my legs stop aching, today is the sky watch! 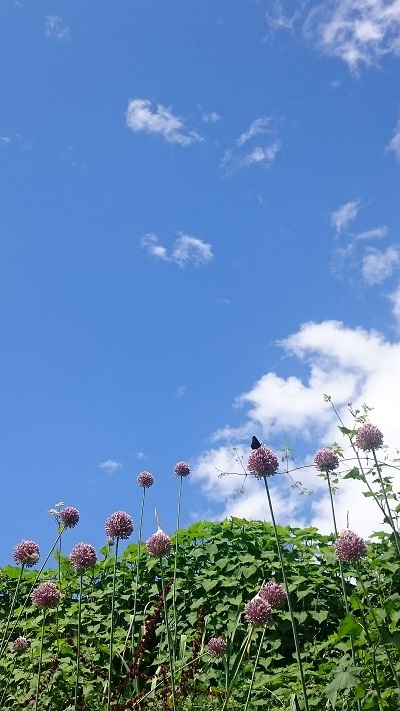 It is a blessing to walk around Jagatsukh with blazing blue skies! I was taking a stroll with Chhavi and Kartik, Ramakant ji’s small son. There was no agenda but we ended up going to the stream. The kids got wet within no time. I lured them out with a promise to buy stuff from the local shop. They came back loaded with chocolates and other such things. I enjoy such walks! 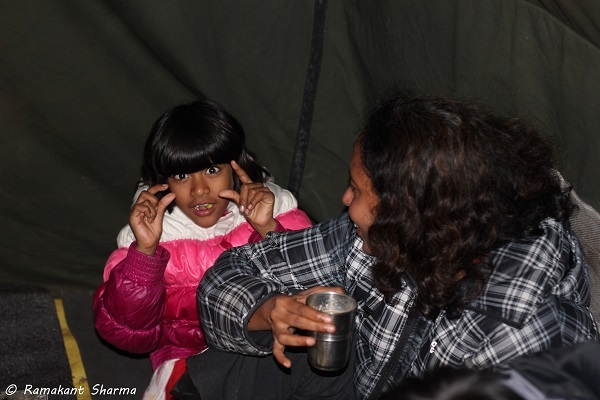 Himachal Pradesh Trek with Kids! 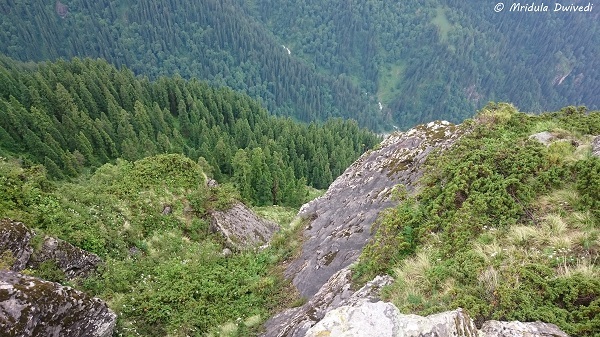 If you are fit I would strongly recommend that you trek once in your life! I have to say my frame of mind was quite different on this trek because we had two kids with us. Photography took a bit of a back seat. But even then it was easy to stop dead in my tracks and admire the spectacle that the nature presented! I like to twist the saying “in each life some rain must fall …” to “in each trek some rain must fall”. Ours was no exception. I told the kids that rains help in building the character! It also paints the sky with fluffy white clouds! It was such a blessing to stand amidst the splendor of nature when it started painting the evening in its unique colors! And guess what? For miles around we were the only people in this area! I will be lying if I say it is easy all the way to trek with Chhavi. She sulks, she refuses food, and she throws a thousand other tantrums. If you ask her to pose for a photograph she behaves as if she is doing the world a favor! Even for this photograph she jumped after we did it thrice! 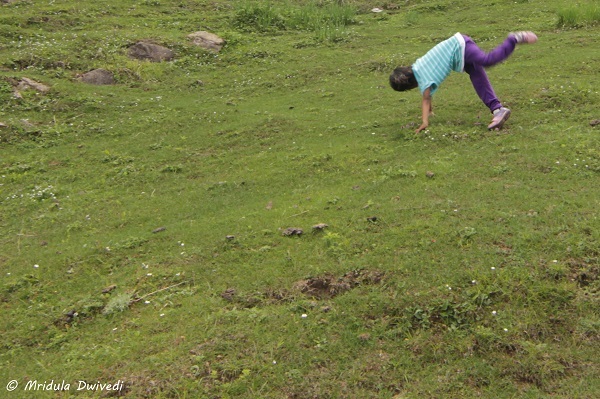 But when she does cartwheels, collects flowers and runs around, I am willing to put up with all her tantrums and go trekking together again!